This great Vietnamese dish was in the September 2012 issue of Food and Wine. And you know, this was one of those delicious examples of really good food that looks nothing like the recipe’s photo. I glazed and glazed and just could not get that really great sticky coating on this chicken. It was amazing, but with a runny sauce. I also used chicken breasts instead of legs, and fewer pieces–but I still made the full amount of sauce, I was too lazy to adjust it. So I know that played a large part, but still. Really good. 2 bone-in, skin-on chicken breasts **the original recipe calls for legs, but as I’ve mentioned again and again Adam’s not a fan of dark meat. Sticky rice **I didn’t follow the original recipe for the rice. I made regular jasmine rice and added the scallion oil to it. 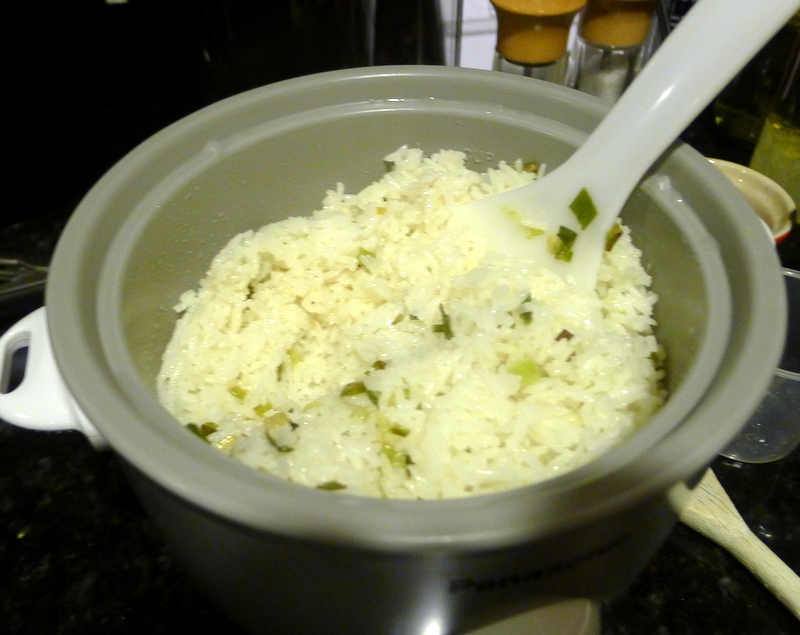 But not the original, more complicated rice recipe. In a large, shallow baking dish, stir 2 tablespoons of the brown sugar with 2 tablespoons of the fish sauce until the sugar is dissolved. 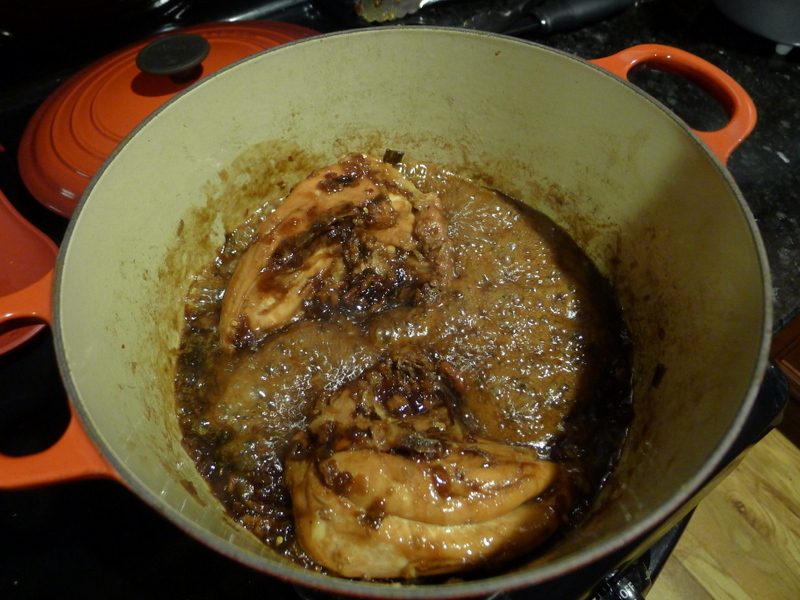 Add the chicken breasts and coat them thoroughly with the marinade. Let the chicken stand at room temperature for 2 hours or refrigerate overnight. Preheat the oven to 450°. In a small saucepan, heat the vegetable oil. 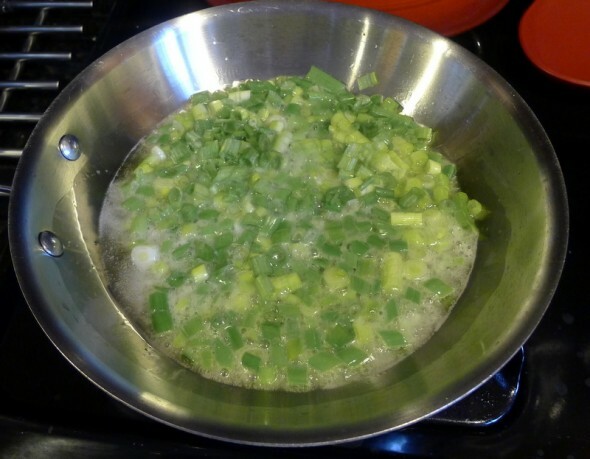 Add the scallions and cook over high heat until they sizzle, about 30 seconds. Remove from the heat. 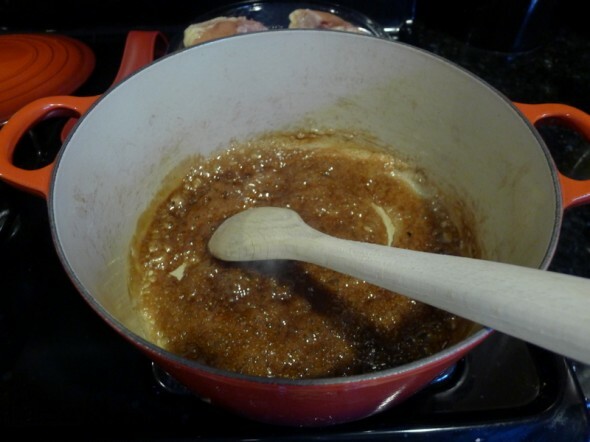 Meanwhile, in a medium enameled cast-iron casserole, combine the remaining 1/2 cup of brown sugar with 1 tablespoon of water and cook over moderately high heat, stirring a few times, until bubbling, about 3 minutes. 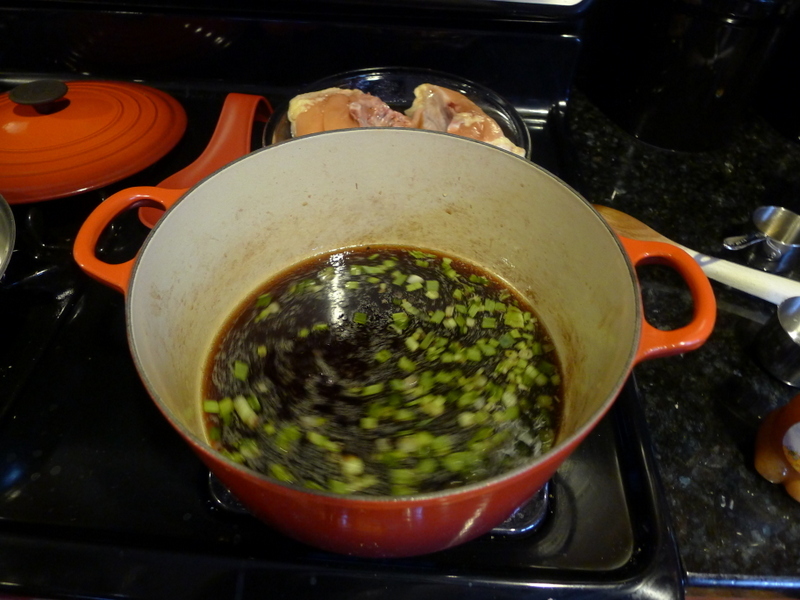 Gradually stir in 1 1/2 cups of water, then stir in the remaining 1/3 cup of fish sauce along with the soy sauce, vinegar, honey and half of the scallion oil. 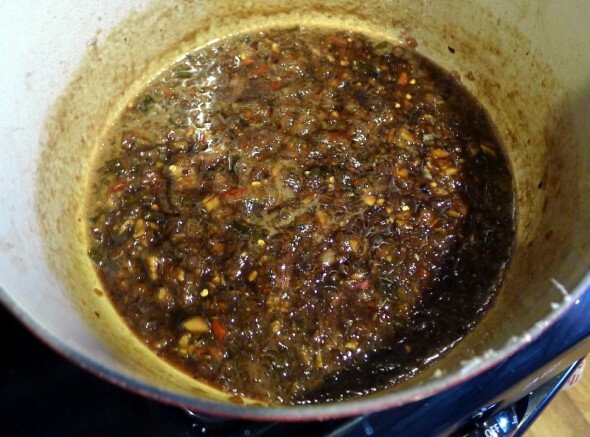 Bring to a boil and simmer over moderately high heat until slightly reduced, about 5 minutes. Add the shallots, garlic, ginger and chiles and simmer over moderately low heat for 5 minutes. Roast the chicken breasts in the upper third of the oven for about 15 minutes, until they are browned. 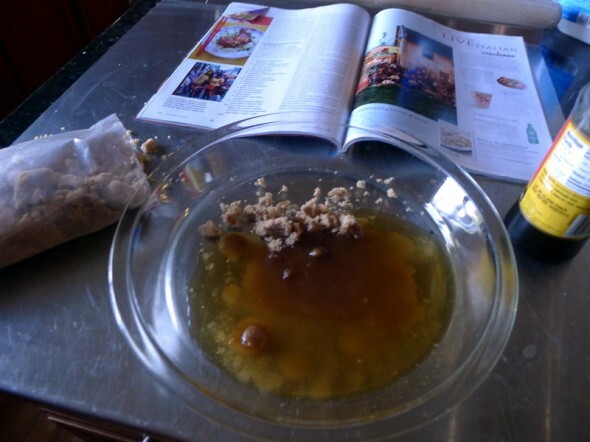 Discard the chicken skin and nestle the pieces in the sauce in the casserole. Cover and simmer over low heat for about 15 minutes, basting the chicken a few times, until cooked through; add a few tablespoons of water if the sauce gets too thick and dark. Meanwhile, make the rice however you choose to. When it’s done, uncover the rice and season lightly with salt. Spoon the remaining scallion oil over the rice and stir gently. 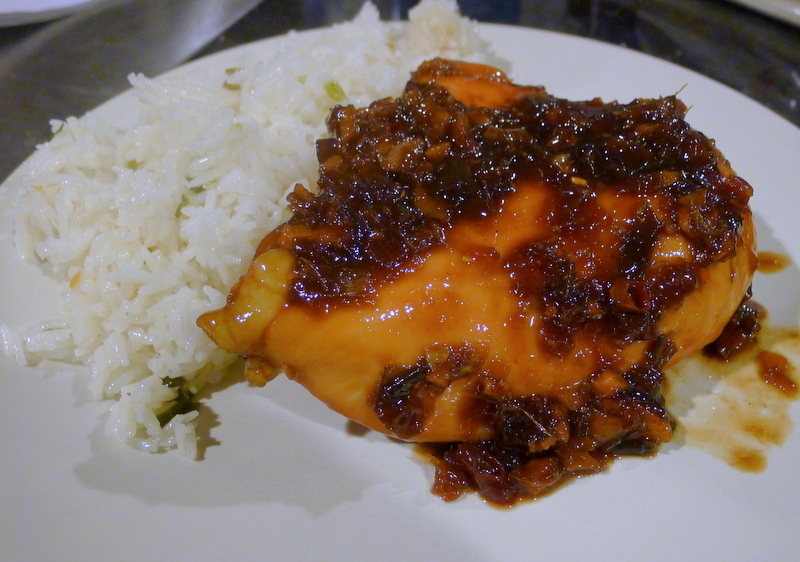 Serve the chicken with the sticky rice.